Hello Everyone who calls in at Jumbled Crafts and thank you for your visit. This is a schedule post from me so I hope your week is going well. Today is the start of a new challenge at Try it on Tuesday and we are always happy to have you join us with your take on our themes. You have 2 weeks to enter and if you are stuck for a project then the team have some great ideas if you visit the TIOT blog. The subject this time is Letters, Numbers or Both so I am sure you will have lots of ideas that we didn't think of. I am not good at making cards for men but I needed to make one for Vic's birthday so I used the challenge to spur me on. Lots of layers added to a large card. Background papers from Papermania and a piece of sparkly card from my daughter. Other elements found on Google or made by me in Paint Shop Pro and printed out. The hearts on the right are die cuts and fastened together with fine ribbon. Definitely numbers and letters for the challenge. Hope you will join us there and also join in at Tag Tuesday as well. You still have a week to join in the textures challenge. I love this amazing project Chrissie - just super! This is a wonderful projekt, Chrissie. Vic will be pleased with this fabulous card Chrissie. Loved the sentiment as well. that is wonderful card chrissie! Beautiful card- hope Vic will love it! A creative design as usual, Chrissie. Love the fantastic clock! 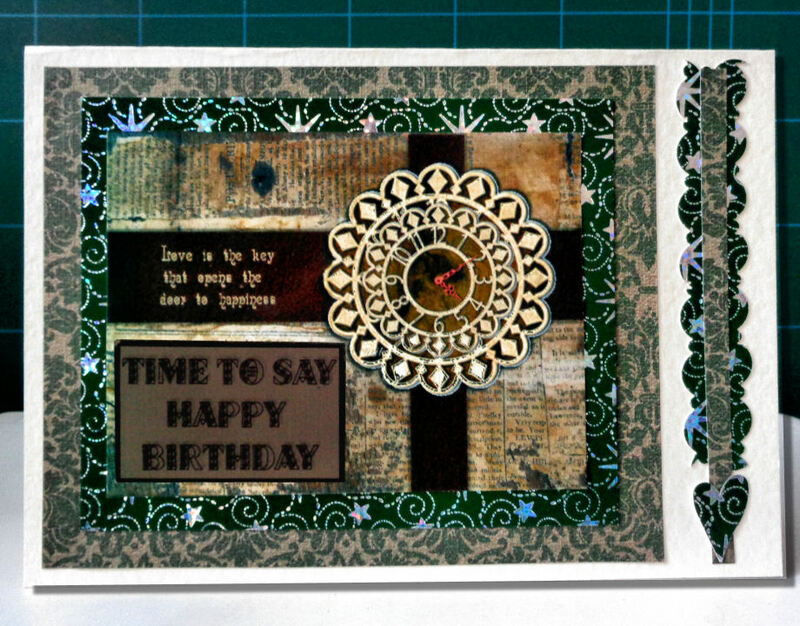 A fabulous card Chrissie, Vic will love it. What a great card - love the colours especially. Love the richness of colour and pattern. I swear Chrissie, I have NO idea how this post got past me. My bad. I am usually not two days late visiting, so please forgive me. Everything about this is gorgeous from the clock to the border to the hearts. It feels neutral to me. It may not be as manly as some I've seen on the internet, but it is manly enough to honor the man you love. I know Vic was quite happy when he received it. It's a true gem. Men cards are so difficult! I think Vic will like this, these are great colours for men. I love the clock element, brilliant!